The niche of smartphones for gaming and for players continues to increase, and now the ASUS ROG Phone is unveiled. The new Android smartphone is designed to provide you with the perfect head-shots and aimed directly at the heart of the gamers. After the Razer Phone , the Xiaomi Black Shark and ZTE’s Nubia Red Devil so arrives the new ASUS ROG Phone. Whether it’s to play PUBG Mobile or Fortnite for Android in the future , there is no doubt that there is already a market and a demand for this kind of smartphones. ASUS knows this and had already explored their interest in this segment. With the increase of the processing power, respective graphics and technical specification of the flagship smartphone arrival, the gaming industry has a new market here. Little by little our pocket computers are also the favorite medium to play games. Raising the concept of mobility introduced by the Nintendo Switch , little by little mobile devices begin to approach the level of gameplay and enjoyment traditionally associated with only gaming consoles. With better graphics every day and frame-rates go up, the future of Gaming has passed from PC to Mobiles . The Taiwan-based manufacturer thus bets on the mobile market through its Republic of Gamers (ROG) platform. This being its forte for Gaming, for games, hardware and peripherals for games and for players. In short, all the rumors that account for the brand’s interest in the Android mobile market are now confirmed. For all players, a new high-end smartphone has arrived. 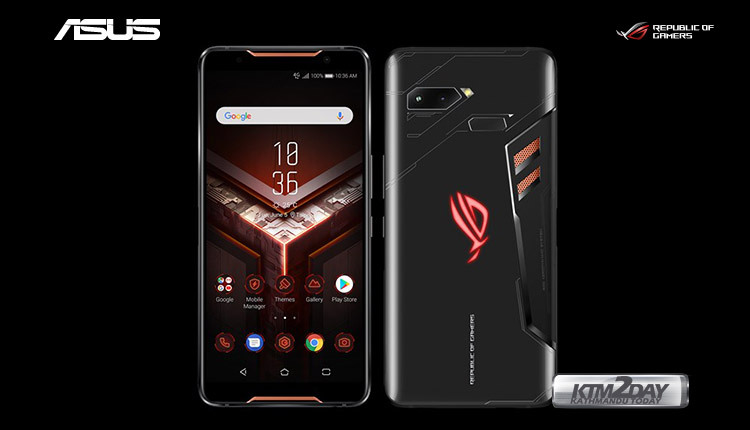 Presenting the Asus Rog Phone !!! As a smartphone aimed at gamers, the ASUS Rog Phone excels by metal and glass construction. At its rear we have several highlights, several cuts and aggressive edges, evocative of the spirit of gaming. Although it’s screen does not have the 120Hz Razer Phone , the ROG Phone has an AMOLED screen with a refresh rate of 90Hz with 18: 9 format whereas in Razer we have an IPS LCD panel. In practice we have an AMOLED panel with Full-HD + resolution (1080 x 2160 pixels) and screen protected by Corning’s Gorilla Glass 6th generation. It also has a special vents and grilles at the rear to ensure that the processor Snapdragon 845 from Qualcomm has “enough air.” That is, to ensure an airflow that refreshes the processor that will increasingly have to account for all frames and graphics quality in crescendo. 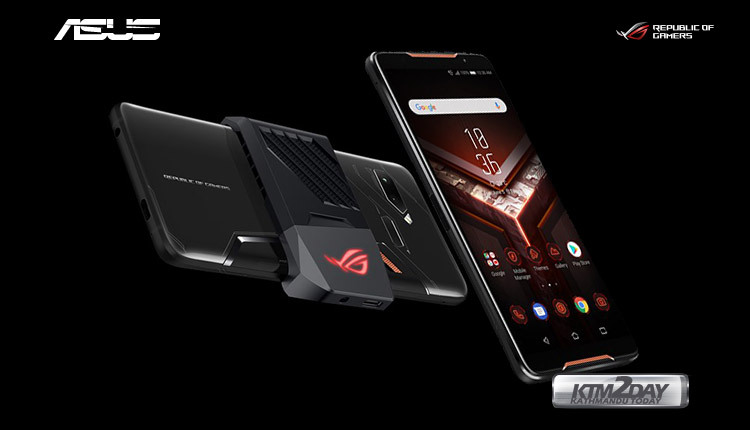 The Asus Rog Phone comes with dual speakers on the front, yes, even on the front panel to give you a true stereo effect. What’s more, we have a 3.5mm headphone jack because it continues to be useful, practical and functional. We also have a Type C USB port for charging and data transfer. The smartphone comes with some predefined actions(commands) that can be customized. In other words, you can replicate the feeling of having a command, a controller in your hand. Something particularly useful for those who like to create shortcuts to certain actions in the game. Under the hood, the Rog Phone is powered by a 2.8 GHz Qualcomm Snapdragon 845 processor to hand all your essential tasks. The handset is coupled by 8GB RAM and a choice of 128 GB or 256 GB storage option. There is an absence of storage option through microSD card. In the camera department, the handset come with dual camera on the rear panel with 12 MP and 8 MP wide angle lens to take care of all photographic needs, while on the front it comes with 8MP selfie camera. The ROG phone is powered by a 4000 mAh battery , capable to withstand the full sessions of your favourite games. 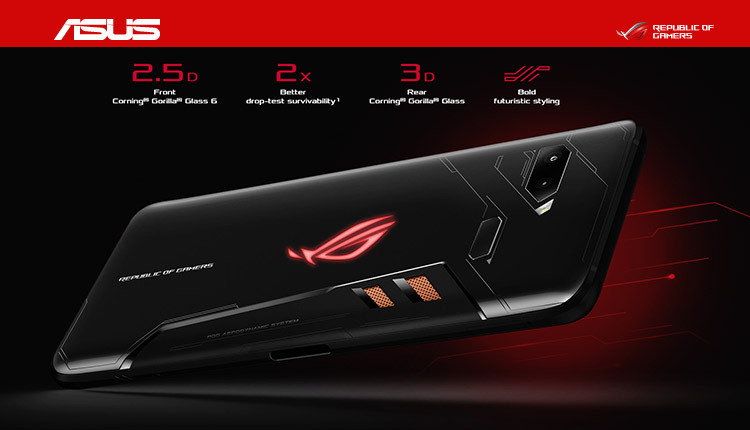 As a highlight, the ROG Phone features ultra-fast mobile Gigabit + LTE and 60 GHz Wi-Fi connectivity for superior performance even in areas congested by wireless signals. 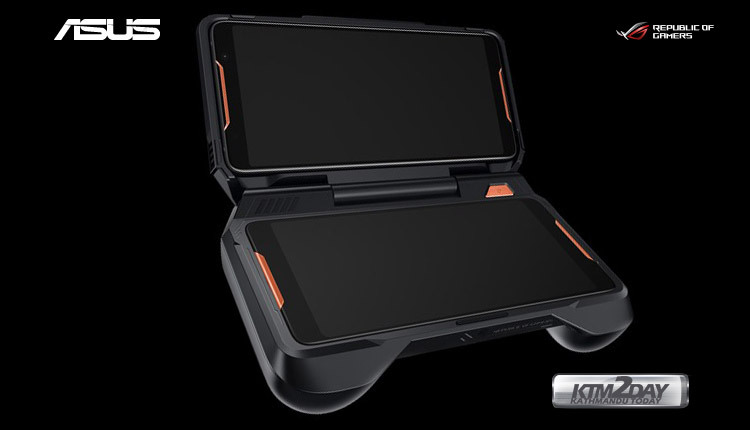 Another great accessory officially accessory included in the package, GameCool which aims to prevent the device from overheating while playing. In the software part, the ROG Phone features “X Mode” , a special game mode that focuses all of processing power on the game, freeing the user from unwanted notifications and distractions. The ROG Phone features an AMOLED panel with an integrated image processor to display HDR video as well as a better image in-game experience. Still talking about the screen, instead of the standard 60 Hz, the screen comes with 90 Hz at 1ms, delivering more fluidity in the graphics. 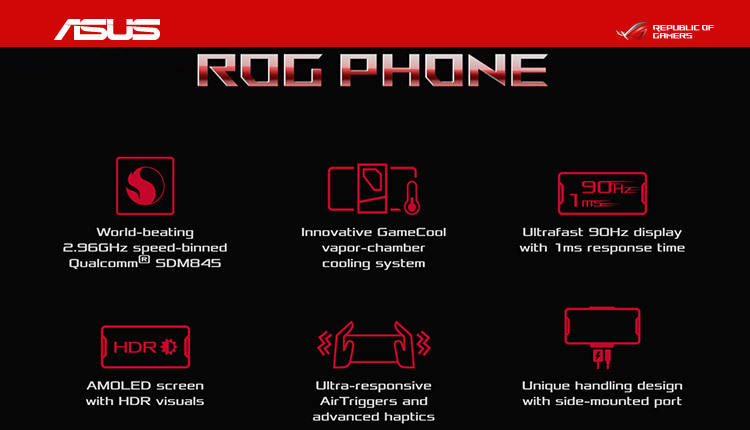 ROG phone also has haptic feedback on the body of the device during games, so the game will have vibration (either right or left side), ensuring even more immersion. In addition as a bonus to the laptop-oriented gamers, Asus also announced a dock with an extra screen called Twindock . The accessory, which can be seen in the screenshots above, comes as something that will allow gamers to stream games while interacting with followers, play two games at once, or watch videos on YouTube. 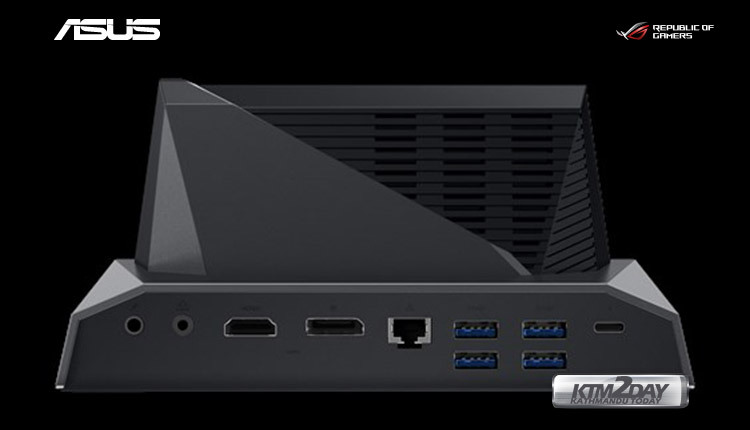 In order to expand the possibilities of use, another official accessory announced was a Dock that delivers several extra connections to the device, including monitor / TV output, keyboard and mouse USB, Ethernet and more. The Asus ROG Phone is currently not readily available in our Nepali market. The price of this smartphone has been set at INR 70,000 in the Indian market and around $900 in the international market.